The courtesans from the three “capitals” Ōsaka, Kyōto and Edo are wearing the jackets of the actors Nakamura Kiyosaburō I, Arashi Koroku I und Segawa Kikunojō I. 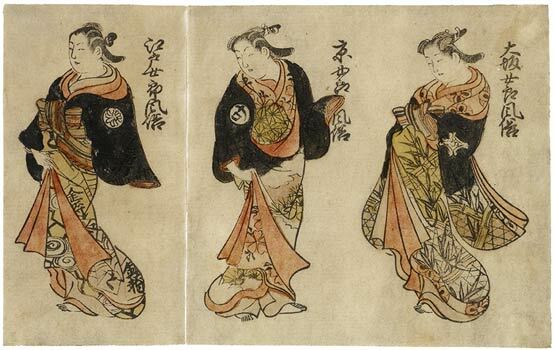 The captions next to the “ladies” state: “in the style of the courtesans from Ōsaka” (r), “in the style of the courtesans from Kyōto” (m), “in the style of the courtesans from Edo” (l.). Their hairstyles reflect the urban fashions of the time. The leaf illustrates one of the favourite themes of the Ukiyo-e of the 1720s and 1730s. It is unsigned and without a publisher’s mark. Arranged next to each other the three Courtesans of the Three Cities stand against an empty background. In the middle is the courtesan of Kyôto, to whom the artist accords the greatest importance. She is identified by the inscription “Kyô(to) Jorô fûzoku” (Genre illustration of the courtesan of Kyôto). The origin of the courtesan on the right is explained by the inscription Ôsaka Jorô fûzoku (Genre illustration of the courtesan of Ôsaka). To the left, the text of the inscription corresponds with the other two, but here the name of the city Edo (Tôkyô) is given. The courtesan of Kyôto in the centre bends her body in a gentle curve to the left, but her feet are turned to the right. She holds her robes together with her right hand. The hand of the bent, splayed left art is hidden under her sleeve in an odd, inexplicable pose. The courtesan of Ôsaka on the right-hand side, in a costly robe with long, swirling sleeves, strides to the left. She pushes her robes up in a bunch with her two hands. Her body pose thus becomes strongly S-shaped. On the left-hand side of the leaf, the courtesan of Edo also turns to the left. With her right hand she holds her robe together, but with a gesture differing from that of the Kyôto courtesan. The sleeves of her jacket hang loosely down from her shoulders. All three bear clearly visible crests on their robes. The kimono of the courtesan of Kyôto is adorned with cherry blossoms and pine twigs, that of the Ôsaka courtesan, with fish-traps and seaweed, as well as filled plum blossoms. The robe of the courtesan of Edo displays spider webs and tablets bearing the inscription kimbashi (gold bridge). Splintered ice and clouds appear on the kimono underneath. The patterns seem too big in proportion to the figures themselves. The three women are of generous physical stature with full-cheeked faces. The hairstyles conform to the fashion of the late 1720s. The theme of this leaf is one of the most popular inventions of Ukiyo-e. The Courtesans of the Three Cities were first depicted by Okumura, Masanobu in the year 1717. This artist is also held to have created their iconography. Masanobu places the courtesan of Edo- identified by the name of the city on her sleeve- at the top of his composition in the form of a pyramid. She hides her left hand under her left sleeve, in which she holds a tobacco pipe which projects. To the right stands the courtesan of Kyôto, who lets the empty sleeves of her robe hang loosely down from her shoulders. To the left, the courtesan of Ôsaka presents herself in her magnificent robe with long, flowing sleeves. When his pupil Okumura, Toshinobu copied the leaf in about 1720, he did not change either the positions of the courtesans or their characteristic appearance. But on a copy produced somewhat later (1720-1725), he described the figure at the top as the courtesan of Kyôto while retaining the appearance which Masanobu had given the woman in this position, save for the pipe which he omitted. The pose of the arm, which is also demonstrated by the courtesan of Kyôto in the centre of our leaf, thus loses its sense. The courtesan on the right side, originally attributed by Masanobu to Kyôto, becomes the courtesan of Edo in Toshinobu’s version, without any change in the iconography of the figure in this position. Kiyomasu II retains the appearance and identification which Toshinobu had employed, but positions the three courtesans in front of a restaurant, still next to each other in the same order. The names of the three cities appear in round cartouches on the curtains. Numerous different lesser and greater woodblock masters plagiarized the theme in the 1720s and 1730s, scarcely changing the iconography. Our triptych takes up the generous, corpulent, full-cheeked type of woman created by Kiyomasu II, but the three figures are less static in their movements. The unknown artist also exchanges their positions, but not the appearance of the two outer figures. Ôsaka, usually on the left-hand side, is placed to the right, Edo to the left. While the Kyôto and Edo courtesans hardly differ in their iconographic characteristics from the “Courtesans of the Three Cities” of Toshinobu and Kiyomasu II, the courtesan of Ôsaka, with her bunched-up robes with hands hidden underneath, diverges in form from the model. The most eye-catching example of this type of courtesan, with robe bunched up at the front pushing her body into a marked S-shape, is shown by Hanegawa, Chinchô on a woodblock dated 1718, of which there is a print in the Tôkyô National Museum and another in Chicago. The left reproduced here comes from the Julius Kurth Collection and was published as early as 1922 in his work Die Primitiven des Japanholzschnittes. It is the only known impression.